Back in January I reviewed and subsequently purchased a custom pair of 24" Skylan stands for my Green Mountain Audio Callisto loudspeakers. I was so impressed with how those stands smoked my considerably more expensive lead-shot-loaded steel stands, I had to have them. It turns out that Skylan's Noel Nolan also offers a line of affordable resonance control platforms he calls Damping Boards. Recently wowed by Grand Prix Audio's no-compromise SOTA assault on resonance control via their Brooklands system, I know how effective these products can be. However, not all of us -- including yours truly -- can afford to heat up our credit cards to the tune of four grand for a Monaco rack or similarly priced products from HRS, Silent Running and others. There must be less expensive alternatives that offer some improvement if not quite to the degree of the above-mentioned high-falutin' brands. After a couple of email exchanges, Noel sent me two attractively contoured and finished Damping Boards for review; a black two-layer board as well as a red triple sandwich. Dimensions are 17.5 x 15 inches. The boards should fit most standard equipment racks and are designed to rest directly on the shelves. The boards are essentially two or more 5/8" thick MDF panels with a proprietary viscous material sandwiched between each board. Several steel pins connect each MDF layer to the one above and/or below. They are available in a variety of different sizes and colors. Just email or call Noel with dimensions and color choices. I'm sure he can accommodate you. Also shipped were several Ceramic Mushroom footers. According to Noel, the Damping Boards should sit directly on existing rack shelves, with components coupled to them via Noel's magic mushrooms. Instead of carbon fiber or other high-tech polymers, the 'shrooms are ceramic with thin strips of neoprene-type material affixed to bottom and top. Noel is still experimenting with his ceramics, therefore pricing hasn't been set yet. Expect somewhere in the neighborhood of $60 per set of three. The included instructions suggest experimenting on where to place the footers under components. I tried them with all my components, with and without the platforms. The platforms can also rest on the floor with the included steel spikes (or soft-ended threaded bolts to protect your wooden floor). Noel mentioned that the boards would be especially useful under small 30-33" tall floorstanding speakers not only in controlling resonance but by elevating the speaker to optimum listening height. I asked Noel to explain how his boards function. Based on what I have learned to date especially from GPA's Alvin Lloyd, I'm not sure that the notion of draining resonance in a one-directional fashion is entirely valid. I raised this with Noel during a phone conversation and he was certainly confident and convincing in his explanation. I'll leave this potentially contentious issue to the engineers and physicists. Frankly, I don't posses the scientific chops to weigh in. I can only follow my instincts and hands-on observations. "I strongly believe in the drain method of dealing with resonance (having a very hard material directly under the component chassis and then on top of a damping system which is not soft). In this fashion the resonance is conducted down from the chassis through the hard material (ceramic/glass/steel) and controlled in the damping platform underneath. (IMO, the downside to using the factory-installed feet under a component is that they are not always hard or in the ideal position under the chassis to take advantage of proper weight distribution. This in turn allows resonance to get trapped and it cannot be efficiently be conducted away and controlled by another source.) This may seem a bit contradictory to the way I have the Damping Board set up as I use a latex material in-between the MDF boards but I also have slim steel pins (set out in various places) conducting resonance from one layer down to the next. This allows for resonance to change frequency and get absorbed and damped. 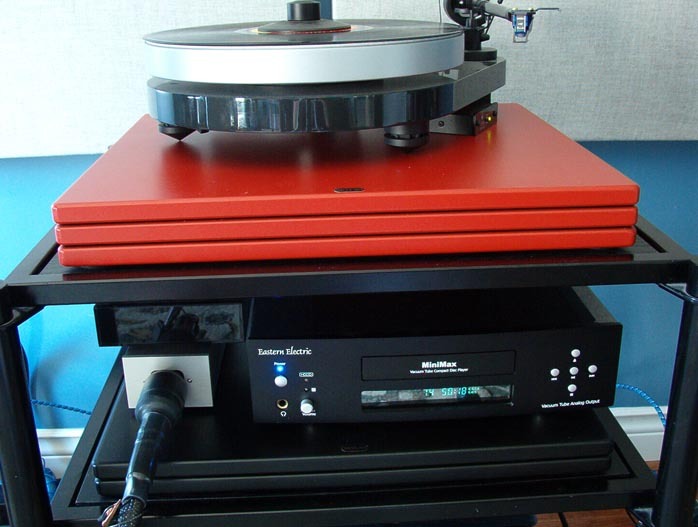 Using an extra layer adds more damping for turntables." Considering MDF's less-than-stellar rep when it comes to equipment shelving, I was surprised -- just as I was with Noel's speaker stands -- to find just how effective his platforms were. As with anything in audio, implementation seems key regardless of material used. The sonic effects of the Damping Boards were subtle but consistently positive. 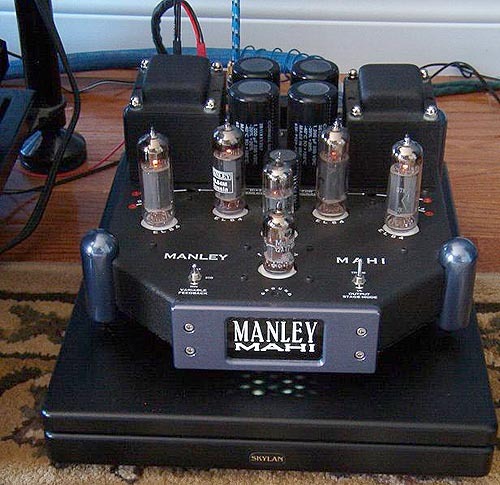 I tried the boards under my recently departed Stingray, Minimax CD player, RPM-5 and Audio Zone's chip amps. The biggest difference with the Damping Boards was in tonality and focus. Bass was more solid and controlled. The mids warmed up a tad. The top end was sweetened just enough to reduce glare. Leading edge attacks and decays of notes were more distinct. Overall, music playback exhibited greater focus and definition with enhanced resolution. Thus, complex musical passages especially on large-scale orchestral or choral works were easier to sort out. 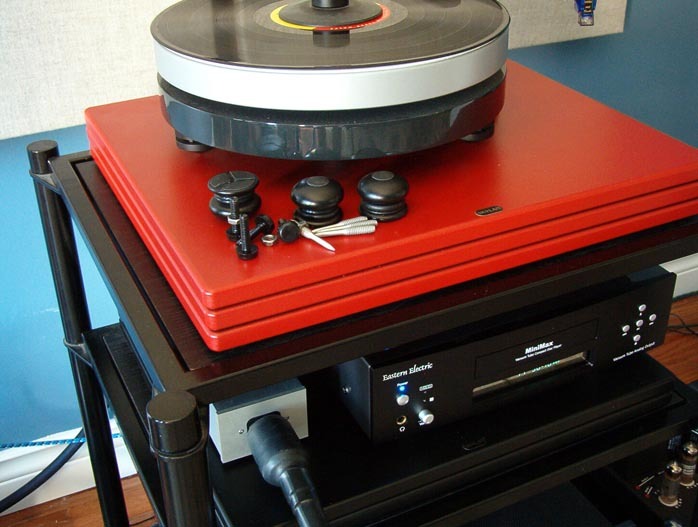 The triple board was the more effective of the two, especially under my RPM-5 turntable. If there is a downside to the boards, I suspect they could possibly warm things up too much in systems already on the dark and cozy side. However, the Ceramic Mushrooms, whether used under components or Damping Boards, should prevent this. They tended to shift the tonal balance upwards. They would be ideal for infusing a little more life and air into an overly warm sounding system. Keep in mind that the Ceramic Mushrooms and other non-compliant footers are essentially tuning devices. Effects can be unpredictable and may potentially imbalance a system. I certainly preferred the mushrooms over the stock feet of my Minimax. However, I did not when I placed them under all of my components. The 'shrooms certainly opened up the soundstage and injected a little high octane but also tipped up the treble a tad too much for my taste. They did not perform well when placed under my RPM-5. 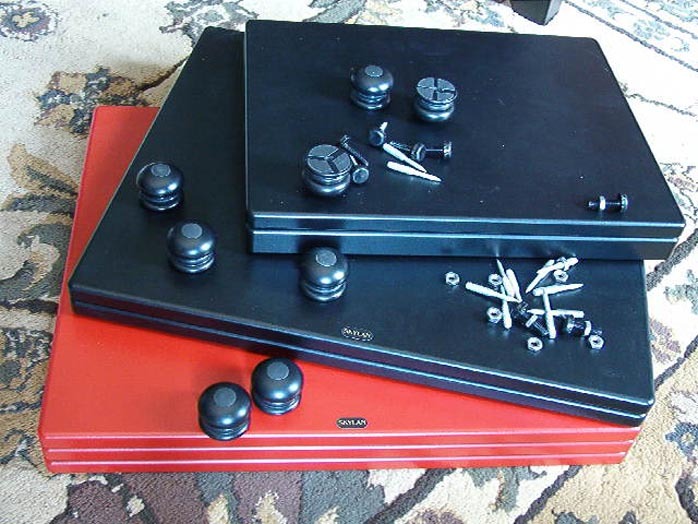 The stock feet coupled to the triple board was preferable. If their final retail price hits in or around $60 for a set of three, then I can certainly recommend them for those wishing to experiment with aftermarket footers. loaners but also sprang for a pair of custom boards (each with one 5/8" and one 1" MDF panel) for my Manley Labs monoblocks. 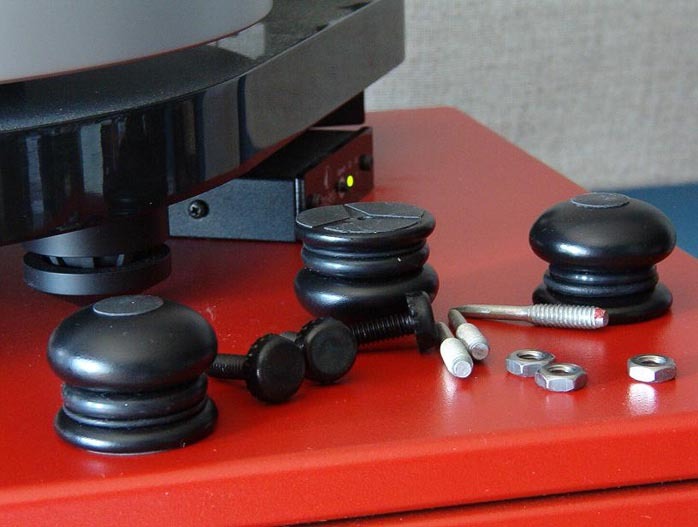 Together with the Vibrapods, Skylan's Damping Boards are an inexpensive yet effective upgrade compared to leaving my amps directly on the floor. It is now impossible to listen to music with the Mahis directly on the floor. While not in the same league as Grand Prix Audio's Brooklands shelving system in performance and appearance, Skylan's Damping Boards are considerably more affordable yet surprisingly effective, especially for amps situated directly on suspended wood floors. Another relatively low-cost platform is Gingko Audio's Cloud 11 platform, one of which currently resides under my preamp. It offered a considerably lower noise floor with more focused and refined playback. The Cloud 11 was king of the hill under my RPM-5 turntable. While the Damping Boards blew away the thin shelf of my welded steel rack, they did not offer as much low level detail retrieval, refinement or degree of isolation as the Cloud 11. 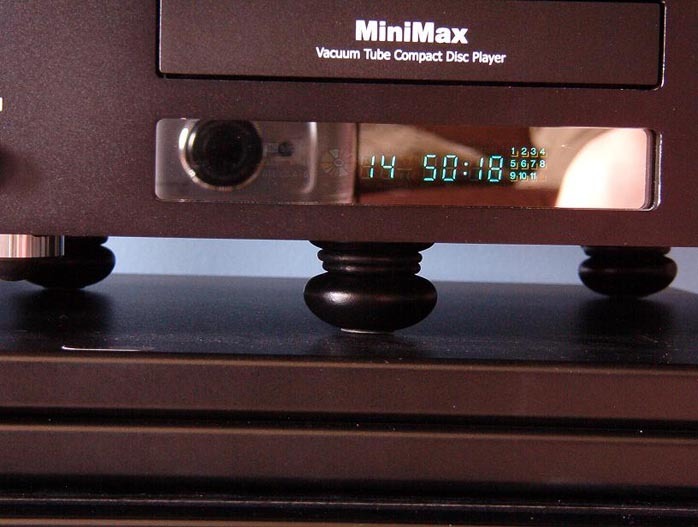 I can literally jump up and down on our suspended wood floor without my RPM-5 missing a beat. However, the Gingko is twice the price of the two-layer Skylan Damping Board. If you're really strapped for cash, our own John Potis recently obtained excellent results using thick maple cutting boards while reviewing a Musical Fidelity amp/CD player combo. I wonder how they'd compare with Noel's boards. Hmmm. Until the day I either win the lottery or sell off a kid or two to afford the likes of a Monaco, Noel Nolan's Damping Boards will remain right where they are - under my equipment.